What To Look For When Buying A Skateboard For Beginners? Skateboarding, A way to relax, get some fresh air, some light exercise and while it’s amazingly fun, searching for your first board can be tough. Too many choices with different types of boards in the market and don’t forget bearings, wheel sizes along with deck sizes. Making a decision can be tough which is why I have created this list of best beginner skateboards that I think you should get. Now anytime somebody asks me for suggestions on which skateboard they should buy, the very first thing I ask..
Now if you know even a little bit about the skateboard world you know there is a huge difference but if you don’t, here is what that difference is. Skateboards are smaller and simpler in design meant for fast riding, tricks and adventure. Are you looking to ride fast and do tricks? Then a Skateboard is what you need to get. Longboards are larger and they are meant for smooth rides for long periods of time. Are you looking to ride something on your way to class or down the road for longer periods of time that can also absorb all the shocks? Longboards are the way to go. Check out my list of Best Beginner Longboards Here. If you were to dig deep into what all you can pick when getting a skateboard you will confuse yourself even more. Everything from bearings, wheels, trucks and decks can be a whole new article, but if you are looking to learn something and make the right decision this part is a part of it so you don’t go in blind. There are various parts to what you can buy and whether or not you need that. You can learn more about that in our buying guide below the list. At first glance Rockbirds can seem like an expensive high end board compared to others in the list but there is a reason for it’s price tag and that is quality. Rockbirds 31″ complete skateboard is meant to withstand weight upto 300kgs. It can do so because it utilizes top of the line parts and material. Specs: Rockbirds is 31″ x 8″ wide deck that enables beginner riders to gain more space on the deck for comfortable footing and learning. At 80.4 ounce is considerably light weight considering the deck is built with 7 layers of Canadian Maple wood. That’s right. 7 Layers. It also comes with aluminium trucks and 4 polyurethane wheels. Parts: The 7 layer maple ply is meant to withstand weight upto 300kgs and yet feel lightweight enough to be able to carry it anywhere. Wheels utilize ABEC 7 chrome steel bearings and the wheels are supported by 5″ aluminium alloy trucks to their 53mm wheels. The wheels are made of polyurethane but with impact resistance ABC as base lining to provide that extra shock absorption. The package also includes a convenient caring bag and a Mini T type skate tool for easy modifications. Overall: It’s a complete skateboard well built for sturdiness and provides value for it’s price in longevity. The bearings are super smooth from the start and can provide fast speed riding in ease. It comes completely assembled and is my number 1 pick for best skateboard for beginners. Butterfly Jive complete skateboard is built to take the blunt force of beginners crashing and trying tricks for the first time. The double concave kick design helps guide beginners with right foot placement with great design to show off. Specs: Butterfly Jive is a 31.5″ x 7.75″ size made from 7-ply Canadian maple with mild concave for ease of learning and riding the skateboard while also be able to perform and learn tricks. Parts: Butterfly Jive comes with a variety of high quality parts that ensure smooth rides such as it’s ABEC – 7 high speed Punisher Bearings along with Riser Pads and Polyurethane cushions to make smooth turns and pivots easily. The 5.00″ inch trucks are custom painted to match the skateboard design. Alloy heavy trucks are perfect for the width size of the deck. This allows the beginner to be able to learn with just enough space and comfort on the board and as they progress easily be able to make the transition into tricks. The 36mm Polyurethane skateboard wheels work well with the ABEC – 7 Punisher bearings in providing a smooth and easy ride. Especially when learning. It also comes with 80AB heavy duty grip tape to ensure your feet stick comfortably to the board. Overall: It’s a really good skateboard built for beginners that ensures everything is perfect right out of the box. No assembly required and you can just gift it to someone and they can start riding this best skateboard for beginners as soon as they receive it. Are you looking for a skateboard from a well renowned brand that is cheap enough to just test and see if skateboarding is something you will stick with? Or just something to get till you have to absolutely get a better skateboard? Then Krown Pro Complete Skateboard is the one for you. This cheap skateboard made by Krown, a very well renowned name in the industry is bringing this board for all the beginners and not sure hobbyists. Specs: Made of Canadian Maple with 7.75 inch width deck it is the perfect size for a beginner to get started on. Of course the Canadian Maple wood helps a lot too at this price point. Parts: The 52mm 99A wheels sit right in the middle of the chart where they are perfect for every type of trial whether it be streets, parks, rails etc but they are also not meant for one thing. The hardness of the 99a wheel ensures speed and rebound. The 52mm graphic wheels by Krown help you try out the board and different experiences but say if you were to use this board just for streets? It can be used just for streets but the experience will not be up to the par, the same goes for if you want to play with this skateboard in the park. You absolutely can, but the experience will not be too good. Rather use this board to try everything? Then yes. You will very comfortably get to try everything. Same goes for the trucks that support the board. Overall: KPC Pro complete skateboard is perfect for anyone looking for a cheap beginner skateboard to just get into the sport and get started. The Canadian Maple build and 52mm wheels will support up 180lbs easily and with it being already assembled there is no time wasted in getting it out of the box and getting started. Let’s say for whatever reason you didn’t like the Krown board, maybe you didn’t like the design or maybe you didn’t like the brand but really liked the specs and the price point and wanted something in that range. Then the CAL 7 Complete Skateboard would the choice for you to get. Specs: Same as above, 7.5 inche Kicktail Maple Deck built for beginners and adults. The different variety of designs and build quality is really good for the price point and for it’s purpose. Parts: Cal 7 comes with 31mm 99a durometer polyurethane wheels. Which if you read above are perfect wheels for trial and error when starting to skateboard early on. The durometer of 99a is tough and provides good rebound which helps you to try out tricks while also being able to ride on mild rough stuff, ideally not suggested. The wheels are supported by 3mm riser pads and quality bushings so as to avoid wheel bite and risk injury when learning to ride. Overall: Overall Cal 7 is a really good complete skateboard for the price which comes pre assembled along with grip tape and with 1 year warranty. Let’s say you have absolutely no interest in riding fast or doing tricks. Parks? What parks? You just want to cruise around your neighborhood or city but don’t want the hassle of longboards. Then a mini cruiser skateboard is what you need. Made from plastic with bigger wheels ensure a smoother ride on the road with good stability. Also since they are made from plastic they don’t require grip tape so you get a sweet design all around the board. The Penny brand has kind of become the official brand for plastic Penny type boards. Thus it shouldn’t be a surprised when the very first time in the list is Penny Nickel 27. Although a bit on the higher price side, it makes up for it with high quality long lasting board that provides smooth ride all along. Parts: At 83A durometer the wheels provided in Penny Nickel 27 are superb for street cruising. Essentially at 83A they are not soft enough that they do not pick up speed or hard enough that they don’t absorb any minor shocks or bumps. At 83A they manage to absorb just the right amount of vibration and still provide well enough speed to cruise around on them. The wheels are supported by ABEC 7 stainless steel bearings. They do require a few times of usage to really break into but once they do it’s a smooth ride from there on afterwards. Overall: Don’t let the price tag deter you from buying something that is quality and long lasting. 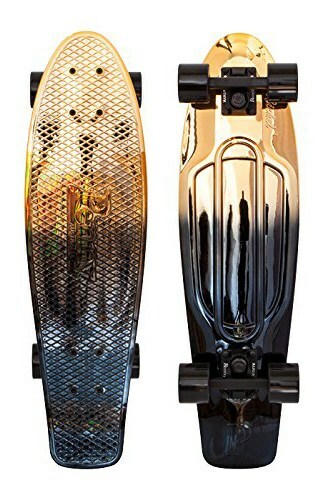 Since it is plastic it will last you a long time even in storage and with high quality parts and well assmebled kit, it’s a perfect mini cruiser skateboard to get. Also if you are buying for a child there is a smaller size of 22″ inch available but I will suggest going for the 27″ either way as it is much easier to learn and balance on. So maybe you want to get a mini cruiser board but don’t want to spend a lot. What should you get then? In which case the best choice would be Ridge 27″ skateboard. 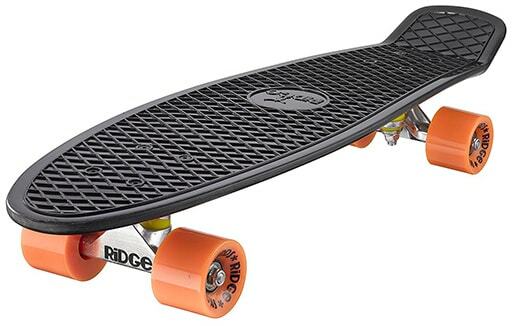 Specs: Ridge is a 27″ long and 7.5″ wide which gives it enough space to balance and ride on. 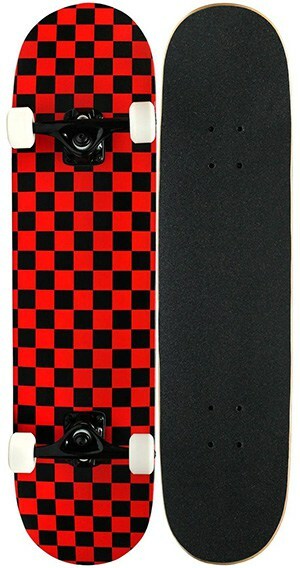 The deck design is pretty basic of black color with a choice between wheel colors such as orange. While the color design is not out of the box or very good, that doesn’t define the quality of the board. Which is really good. Parts: The wheels are 59mm big with 78A softness. While the size of the wheels is not the largest and neither is the toughness or softness. The wheels function very well for the purpose of cruising. They are soft enough to get over cracks and bumps with ease but not tough enough to really be able to capture the speed. Despite that, it is pretty fast. Although with right bearings there is nothing stopping it from going as fast as possible. Overall: The Ridge brand is well known for there boards and there is a reason for it. Which is quality. Yet it is possible that to cut price and to be able to provide this board for so cheap can mean a few broken parts over time. 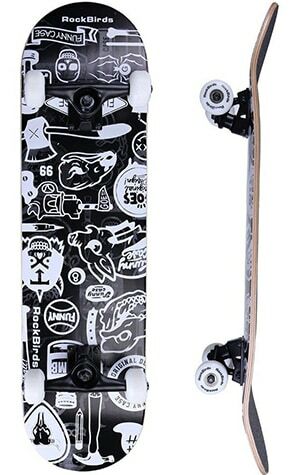 Other then that if you are looking for your first cheap mini cruiser skateboard, then this is the right one to get. 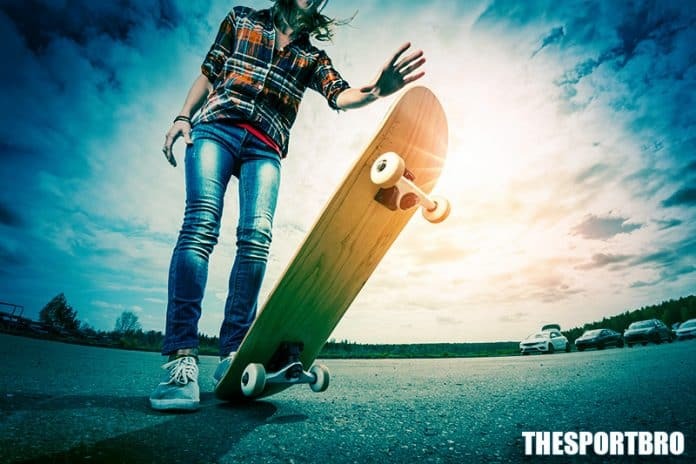 Now that you have gone through our list of best skateboards for beginners, let’s talk about some of the things you should keep in mind when getting a skateboard. Along with the sweet board, Get some sneakers from our list of top skate shoes. Why only Maple Wood Or Plastic Skateboards? I am sure if you have searched enough about different types of skateboards, you must have come across different deck materials such as bamboo, fiberglass and etc. Yet my list only comprises of Maple Wood And Plastic. Why is that? Well simply because they are cheap, affordable, widely available and provide well enough build quality that can last you for a decent amount of time. Deck materials such as bamboo, fiberglass and others are great if you far along your skateboarding experience and looking to try something new and different. They are great then but Maple Wood and Plastic are the most commonly used deck material which means you can often find wide variety of skateboards in those two types of decks. Assembling a skateboard requires a bit of know how of what parts you are attaching together. It is a great option for anyone who is a little bit experienced and want to build a perfect skateboard that helps them ride much better. What if you are buying a skateboard as a gift or just want one to get started? Perfect. You can pick one of the ones that we have listed above that are ready to be used and ride right out of the box. An assembled skateboard is quality tested, made by professionals with right specs and made available for quite cheap in the market. Rather than you guessing on specific parts the first skateboard for beginners should be already set to go. And as they become more experienced they can modify it along. That brings us to end of my article on beginner skateboards. I am sure you can have some thoughts on it and feel free to write them down in the comment section below. One thing I will like to add, your first skateboard can be any skateboard as long as it points to the right direction of use because once you gain some experience riding it you can upgrade to a better piece accordingly. So struggle of finding your first best beginner skateboard should not hold you back. Just get one and get started.